The two paper topics highlight main discussion points from the Policy Dialogue. 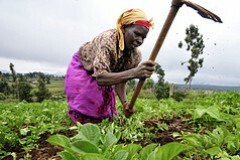 The Global Agriculture and Food Security Program (GAFSP) steering Committee launched the second Public Sector Window Call for Proposals to eligible countries on January 10, 2012. The deadline for submission is midnight on March 31, 2012 (Washington, DC time). Additional details about the application process, eligibility requirements, and guidelines are available in the attached Second Call for Proposals—Public Sector Window Announcement (January 10, 2012), and in the Revised Country Guidelines for the Public Sector Window (January 10, 2012). Lead The Change (LTC) is dedicated to developing social leaders; well-rounded youngsters who are equipped with leadership skills to solve the challenges faced by their communities. Its core aim is to ignite young hearts with holistic concern for their society and nation. LTC Program from March 12 will involve upto 30 youngsters in a six week program. The program will expose them to pressing issues of our societies such as human dignity, education and rural immersion. They will study solutions offered by role models, personalities and get a short experience in leadership education. They will be expected to apply this experience to come up with solution for a small local issue and in the process, understand how to set up an enterprise. They will emerge with the wealth of a rich network and a sound understanding of systemic social change. We need your help in spreading the word about it. It will take place in Delhi only. Please share on your FB profile, tweet, tell your friends and anyone who might be interested in such things. Please connect me with other youth organizations in Delhi, media persons, Student Unions etc. The UN-HABITAT invites young people based in cities or towns from the developing world to apply for grants of up to USD 25,000. Applications open 15th February 2012 and close April 15th 2012. To qualify for a grant, the project in question must be led by young people aged 15-32, and be based in cities or towns in developing countries. Grants will be targeted to the young people who need assistance the most, particularly disadvantaged youth in urban slums. Projects promoting gender equality, or involving partnerships with the government, the private sector or civil society are especially encouraged. For more information regarding the 2012 call for applications, please go to; http://www.unhabitat.org/categories.asp?catid=637.ITAT invites young people based in cities or towns from the developing world to apply for grants of up to USD 25,000. Applications open 15th February 2012 and close April 15th 2012. To qualify for a grant, the project in question must be led by young people aged 15-32, and be based in cities or towns in developing countries. Grants will be targeted to the young people who need assistance the most, particularly disadvantaged youth in urban slums. Projects promoting gender equality, or involving partnerships with the government, the private sector or civil society are especially encouraged. For more information regarding the 2012 call for applications, please go to; http://www.unhabitat.org/categories.asp?catid=637. Nepal Academy of Science and Technology(NAST) is going to organize 6th National Conference on Science and Technology on June 6-8, 2012 in Kathmandu, Nepal. Conference Theme: “Economic Growth through Science, Technology and Innovation”. SCIENTIFIC PROGRAM: The scientific program of the conference will include invited key note addresses, plenary lectures, oral and poster presentations. Sectional sessions will be held for paper presentations as categorized in the following disciplinary areas. The fees can be paid by bank transfer (T/T or M/T), bank draft/voucher or money order (D/D) payable to the NAST. CALL FOR PAPERS by April 12, 2012 (Chaitra 30, 2068). The Undergraduate Ecological Project Support Grant is only open to current BES members and to applicants from a country classified as having a ‘low and lower-middle-income economies’ according to the World Bank categorization. This grant is intended to include a stipend to cover the time taken doing ecological research work for up to a maximum of eight weeks. The grant can include travel and subsistence in addition to the stipend (but the same costs can not be requested in any accompanying Small Ecological Project Grant application). Work can be undertaken up-to 6 months after graduation, but cannot be part of an honours project. Successful applicants will be encouraged to present their work at the BES annual meeting within 18 months of commencing the work. Any resulting publications from the research must have the applicant as the principal investigator. The work can be carried out in the UK or overseas. The research should be distinct from timetabled teaching activities and should primarily have been planned and organised by the applicant. Applications must be supported by two academic referees at least one of which should be a member of staff of the institution where the applicant is a student. This referee should verify that the proposal is not part of an honours project. UEPG’s are given to an individual student who is responsible for completion of a report to the BES. There is, however, no objection to any subsequent paper having co-authors. There is no objection to the applicant doing the work whilst part of an expedition but the applicant has to take the responsibility of completing their own part of the expedition, as a stand-alone activity. Several individuals may submit applications for the same expedition providing their projects are distinct. The maximum grant, including stipend and subsistence shall be £2000. Stipend to be calculated at a rate of £250 per week. This may be applied for in addition to an SEPG grant, though costs cannot be repeated. This grant is only available by applying using the BES online application form (http://www.britishecologicalsocietygrants.org/init.pl). Two accompanying referee statements will be required before the online form is completed. Applicants are therefore advised to fill in and to submit their application form well in advance of the application deadline and to make sure that their referees are contactable by email as referee forms will be automatically sent to referee email addresses when the applicant has completed (and submitted) their online application. (Please advise referees to also look out for these emails in their spam folders). Forms fully completed with both references after the deadline will go into the next application round dependant on the stated start dates of the project. Applications can not be awarded in retrospect for research that has finished or already started by the grant deadline. Goi Peace Foundation has officially announced the open of International Essay Competition for 2012. Future begins with the vision we hold now. What kind of future do you wish to create for yourself and the world? Please share your dream and ideas for making it a reality. Young people from around the world are invited to enter the 2012 Goi Peace Foundation – UNESCO International Essay Contest for Young People. The deadline for entry is June 30, 2012. Ginger farming is one of the main sources of cash income for those involved in its cultivation generating higher net income than any other competing crops such as maize, wheat and fresh vegetables. As of 2010, approximately 66,000 families were involved in its cultivation, covering 18,000 hectare and yielding 210,000Metric Ton (MT) of fresh ginger. More than 30,000 MT of this was exported, valued at NRs. 456 million. In order to encourage competitiveness and exports of selected agricultural and non-agricultural commodities/services, USAID’s Nepal Economic Agriculture and Trade (NEAT) program works with the Agro-Enterprise Center and the Federation of Nepalese Chambers of Commerce and Industry (FNCCI) to strengthen the institutional capacity of Nepal Ginger Producers and Traders Association (NGPTA). NGPTA was formed in 2005 to promote and protect the rights of ginger producers and traders in Nepal and to build their capacity to lobby for ginger-friendly policies. NGPTA’s activities were focused in eastern Nepal, but the country’s main ginger growing area is located in the west-and-far-west regions. Therefore, many stakeholders felt the need to transform NGPTA into a national-level association to represent the entire industry. In support of this effort, USAID’s program recently organized four regional workshops on ‘Strengthening a National-Level Ginger Association’ all over Nepal in order to form a united consensus and finalize the framework for a national association and to prepare its launch. The Alltech Young Scientist Program has officially announced the beginning of the 2012-2013 Competition. Competitors may now register and submit a paper at www.alltechyoungscientist.com or http://www.alltech.com/education/alltech-young-scientist/about . Template is also available on this link: YS paper submission template. This conference aims to bring together experts from around the world in all sub-fields of phenology and related disciplines. The overall theme of the conference is “Future Climate and the Living Earth.” Conference products will include a set of peer-reviewed scientific papers in a special issue of the International Journal of Biometeorology. Deadline of Call for Abstract is May 2012.